Engage your students with these colorful Google Slides as they produce a research report on ecology. 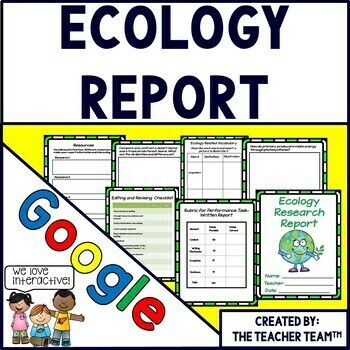 This Google Classroom resource contains a complete paperless Ecology Research Report perfect for Chromebooks, HP Streams, and other devices in a 1:1 classroom. Printable version included! 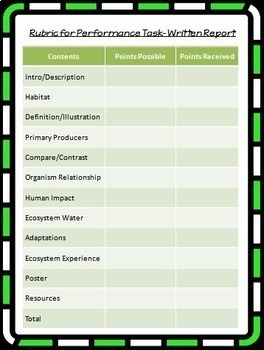 Templates are included to create, develop, write, edit, present, and assess your students’ Ecology Report. This report (or performance task) is also designed to not only to learn and explain the new information, but answer some higher level thinking questions (Common Core Essential Questions). Our product is designed to assess and show what your students have learned and share it with you, their parents, and perhaps the class if you’d like them to present it. 2. 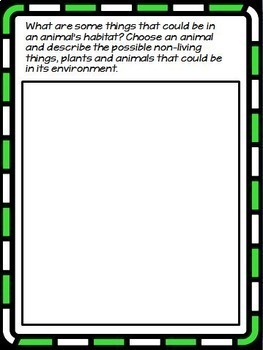 Describe an animal’s habitat (student chooses their animal) including all possible living and nonliving things. 3. Ecology Related Vocabulary- students define the word and illustrate it. 4. How do primary producers make energy through photosynthesis? 5. Compare and contrast a desert biome and a tropical rain forest biome. What are the similarities and differences? 6. Why do primary producers, consumers, and decomposers need each other to maintain a healthy biome? 7. How could humans damage an ecosystem accidentally without even trying to be destructive? 8. What could happen to an ecosystem if all of the water evaporated because of a severe drought and there was no more water? 9. How do you think plants and animals adapt to changes in their ecosystem? 10. Write about a real ecosystem that you’ve seen in your life. It could be in your city or town, your backyard, a tide pool, in a forest, or somewhere else. Describe all of the things that you saw. 11. Make a poster about an ecosystem. 12. Blank page to add to any of the questions if more room is needed. 13. Additional Information page for any other facts not discussed in other areas of the report if needed. 14. A page to help your students find information for their report. 15. Resource Page and Bibliography Template- I use the Resource Page template because my students are not ready to learn the rules of a true bibliography, but if you teach bibliography skills I have included a template for you. 16. Note Taking page for students to take notes as they gather their research. 19. Report Checklist for students to check if all performance tasks are completed and included. 20. Editing and Revising Checklist.